What is round, colourful and can be seen at Easter? The Seven-spot ladybird (Coccinella 7-punctata),of course! Larger than the Two-spot ladybird, the Seven-spot is typically between 5 and 8mm, and has three and a half spots per wing case. Their thoraxes are black, with a white spots on each side. This is Europe’s most common ladybird species, and is one of 40 species which reside in the UK, but there are fears in Britain that competition for food with the Harlequin ladybird will lead to a decline in their numbers. 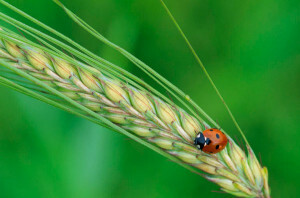 On waking from hibernation, ladybirds feed on the nectar of early flowering plants. So look out for the gardener’s pal on rosebushes, or any other plant affected by greenfly in late Spring, as the average Seven-spot will eat 5, 000 aphids in a lifetime (one year)! Even the ladybird larvae, which hatch from yellow eggs and are black with yellow dots, are hungry predators of aphids. To encourage these robust little bugs, some gardeners suggest providing areas for hibernation, such as leaf litter at the base of perennial plants, or with a nifty “bug hotel” which can be bought at most garden centers. (Although my “hotel” seems to currently be housing spiders and a solitary snail). As a child, I imagine all of us have, at one time or another, been slimed with yellow goo when holding a ladybird. This is a foul tasting secretion is used as a defense and their bright red colour is also used to deter predators. This striking colour led to the word “ladybird”, which comes from references to the Virgin Mary, or Our Lady, who was often painted in a red cloak. In the past, ladybirds were thought to be a cure for toothache, but I for one will stick to flossing!